Plants erect, but possessing more than one erect axis from a short creeping system; up to 1.5 cm tall. Very few indeterminate laterals present. Principal axes with 5 pericentral cells, from an early stage covered by a cortex; main axes to 200 µm in diameter, the segments to 250 µm long. Pseudolaterals monosiphonous, up to ca. 2 mm long, arising one per segment in a spiral pattern; no adventitious laterals present. 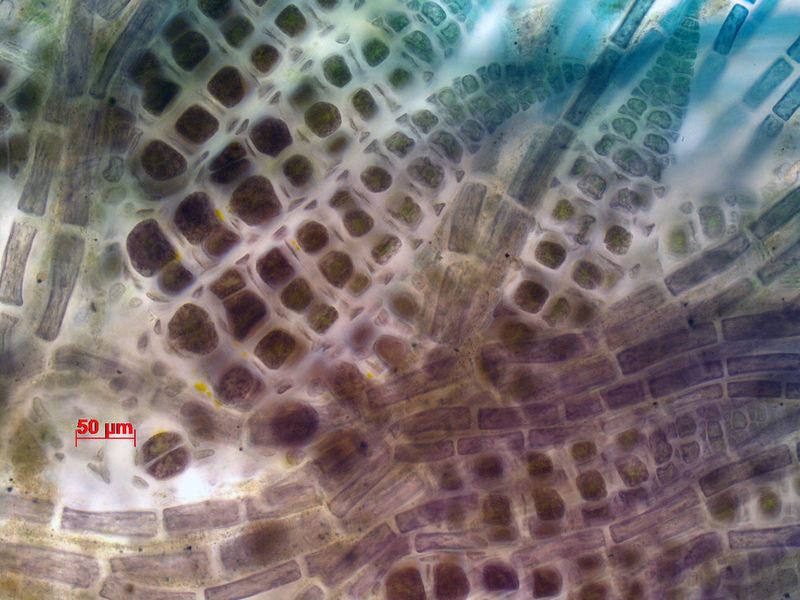 Pseudolaterals branched up to 5 times, with intervals of usually 2 cells (sometimes 3 or 4 cells in the higher dichotomies), diameter from 75 µm basally to 15-22 µm apically. Ultimate ramuli to 17 cells long, nearly straight, the cells cylindrical and up to 4 times longer than broad. Tetrasporangial stichidia usually one per pseudolateral, on the 2nd to 4th ramification, cylindrical with attenuated top, up to 800 X 125 µm. 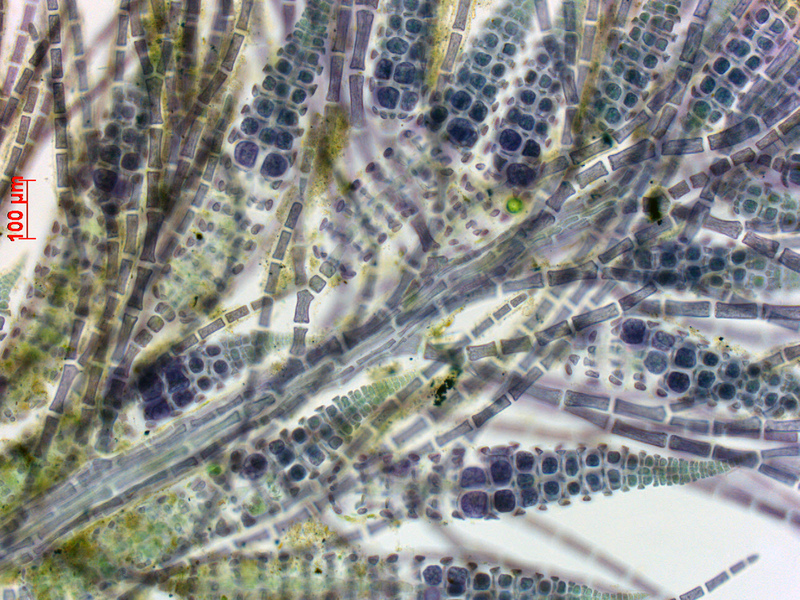 5 sporangia per verticel, at maturity to 50 µm in diameter, each with 3 short cover cells. Sexual reproductive structures not seen. Only found in the Kowie estuary (39), and therefore apparently able to survive temporarily reduced salinity of the water. Attached to floating buoys on jetty. Dasya sp II with tetrasporangial stichidia (stained slide). Dasya sp II sparse indeterminate laterals and tetrasporangial stichidia (stained slide). 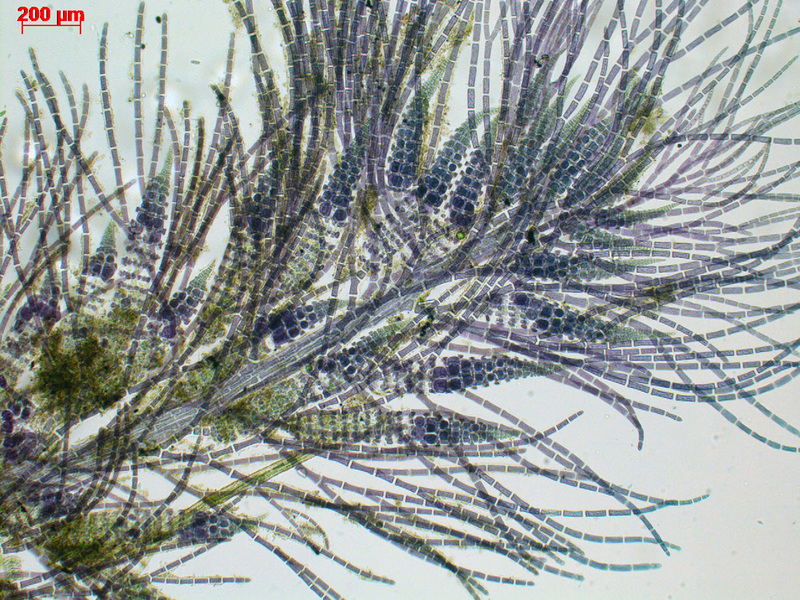 Dasya sp II detail of tetrasporangial stichidia (stained slide).